R&B sensation K. Michelle has taken 2015 by storm with her latest album entitled “Anybody Wanna Buy a Heart” and the countless number of sold out dates on her “My Twisted Mind” tour. Recently, the singer paid a visit to her high school alma mater, Overton High and gave some helpful advice to teens with a passion for the creative and performing arts. 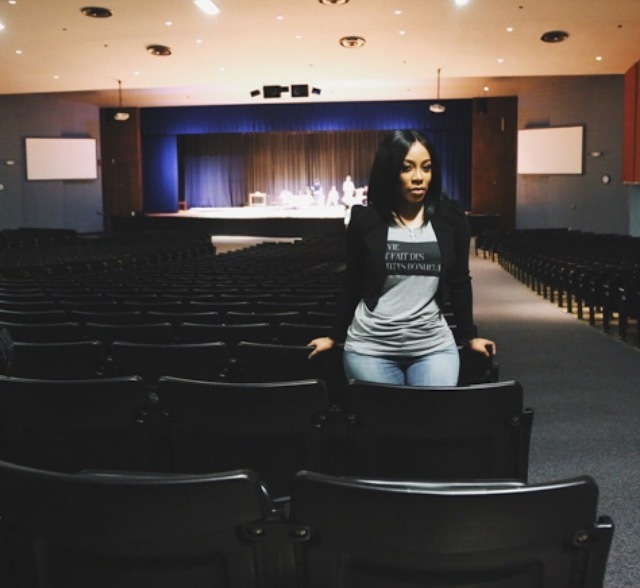 K. Michelle poses proudly in the school theater at Overton High School. Photo by Khari Bowman. As a performing arts student at Overton, I had the opportunity to meet her, which was as life-changing for me as it was for some of my peers. Kimberly Michelle Pate grew up in Memphis, Tennessee and graduated in the class of 2000 at Overton, the only high school in the city dedicated to the creative and performing arts. She was a member of the Student Government Association, Show Choir and was crowned “Miss OHS” at the annual Overton beauty pageant. After high school, K. Michelle attended Florida A&M University where she became a member of Delta Sigma Theta sorority. In 2009, she signed with Jive Records, launching her music career. During her visits to Overton, K. Michelle mentored the school’s choir, dance and drama department as well as greeted and said encouraging words to some of the members of participating sports. In late September 2014, the drama department was rehearsing for its production of “The Wiz” when the well-known singer walked into rehearsals much to everyone’s surprise. She stressed the importance of how being involved in performing arts can take a person a long way. K. Michelle returned to Overton in March and stopped in on rehearsals as the drama department was preparing for its spring musical “Play On.” During her most recent visit to the school, K. Michelle brought camera crews along with her as she visited the different creative and performing arts classes and after school clubs. 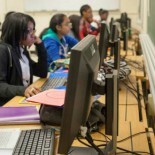 Students were amazed to find out that they would be featured in her documentary in the newest season of “Being” to be aired on BET Centric in mid-2015. Despite the rumors and posts about her on gossip sites, students of Overton got the opportunity to interact with the singer and see how kind-hearted she really was. K. Michelle continues to strive as a performer as well as adding to her brand. With the third released single “Hard to Do” from her latest album, the continuation of the “My Twisted Mind” tour, corporate partnerships, a reality show and a documentary, K. Michelle’s work never stops. The creative and performing arts program at Overton High School helped to shape one of the leading ladies in music culture today and thankfully, she has never forgotten her hometown roots. Awesome article!!! Love to see spotlight articles on Memphis alumni doing well! This entry was posted on May 5, 2015 by theteenappeal in Features, News and tagged Anybody Wanna Buy a Heart, BET CENTric, Delta Sigma Theta, Florida A&M, Florida A&M University, Hard to Do, Jive Records, K Michelle My Life, K. Michelle, khari bowman, Kimberly Michelle Pate, Love & Hip Hop Atlanta, Love & Hip Hop New York, Miss OHS, My Twisted Mind, overton high school, Play On, Rebellious Soul, Rebels, SGA, Show Choir, Student Government ASsociation, The Wiz.